STARDUST: Not sure if thats the official poster…but it does look like a poster doesn’t it. I thought it look nice in its eerie witchy magical type of way. Saw the trailer too. Which yo can view here. I thought it looked ok. Kinda like a mix of Ever After, Brothers Grimm with more of a fantasy feel to it. The stills have also been released and you can view them at the same link. Hope the movie is good. TRANSFORMERS: Is this the first posters of transformers to be released? I think it is…And I think they look pretty cool. Love the side profiles. WAITRESS: Oh my what a cute poster. It looks like one of those 1950’s or 1960’s ads. Love the colours too…very cheery. Its been a while since we’ve seen Keri Russell as a lead in anything…this may be her comeback. I’ve seen the trailer…and it looks like the indie type of drama flick…which means it could either be really good or really boring. Disturbia poster is finally released. It has been said how similar the storyline is to Rear Window…I’m not really sure it is intented to be a remake…but anyway I have mentioned that I wanted to watch Rear Window first so that I could compare Disturbia with it later…So anyhow I have recently watch Rear Window…and I will put up a short review of it soon. Really curious how this movie will turn out. Yes yes. The trailer is out….and it looks funny. Should be good. Check it out yourself here. I love hidden picture gave. Several weeks ago I posted the link to M&M movie hidden picture game. You can still view it here. I recently found another one by LOVEFiLM. 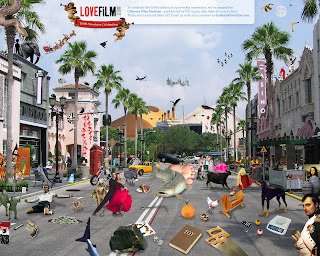 This time you have to find 100 films. I’ve found at least half. Click on the picture to view a larger version.